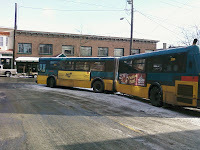 During unusual weather (snow) in Seattle you often run across an articulated bus that is folded back on itself – a jackknife position. 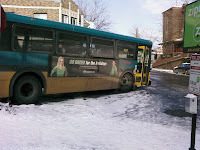 The bus is typically abandoned until the weather improves when they can come rescue it. The bus pictured here seems to be parked as if you could just drive it away. We don’t know what happened that it ended up being abandoned in Fremont.